HUGUENOT—On Feb. 8, the monkey will take over for the year of the sheep in the Chinese lunar calendar and Asian cultures around the world will be celebrating the New Year into second week of February. About 250 people gathered in the Huguenot firehouse on Jan. 31 to celebrate the holiday, an event put on by a group of Deerpark residents who wanted to share the holiday and their culture with the community. “There are more and more Chinese that live in this area and the New Year is a big event for Chinese so, you know how Americans have Christmas parties, we just wanted to have a Chinese New Year party,” said Feng Qing Chang, one of the organizers and a native of Taiwan. 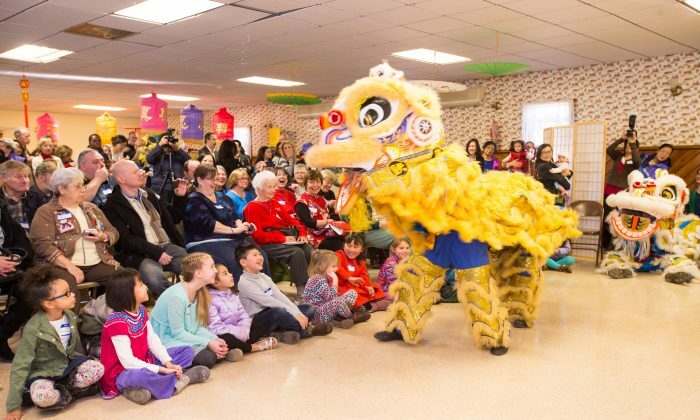 The two-and-a-half hour event had lion dancing, Chinese calligraphy, a Pipa player, over 700 handmade dumplings, Chinese tea, a lotus origami-making workshop, and a Chinese astrology interpreter, as well as a musical performance by students from Fei Tian Academy, a bilingual Chinese-English middle and high school in Cuddebackville that specializes in the performing arts. “We were really happy because we invited Fei Tian Academy of the Arts … we asked for three or four students to perform … and they surprised us with 30,” said Tysan Lerner, one of the organizers and a Deerpark resident. Lerner said they were worried about getting enough people to come, but in the end they had 197 people R.S.V.P. and even more showed up without notice. This was the first year they have thrown a Chinese New Year party, she said, and they plan to do more Chinese holidays going forward, including Chinese New Year again next year.